Before the year 1996, performing accurate vehicle diagnostics was quite difficult. This was occasioned by the fact that there was no standardized method of vehicle diagnostics. However, this all changed with the introduction of OBD II systems. OBD II systems act as the link between the ECU of the vehicle and the owner. The ECU performs regular vehicle diagnostics. When it meets an issue it cannot correct, it switches in the MIL and stores the issue as an error code. These error codes are then read and translated to the user by an OBD II scanning tool. The JDiag JD101 is one such OBD II scanning tool. 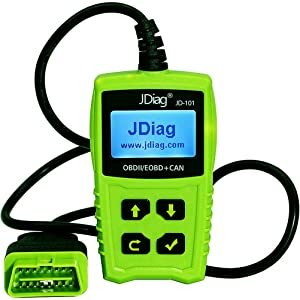 JDiag JD101 is a beautifully designed OBD II scan tool with the ability to read and clear most OBD II error codes. The device is also capable of conducting thorough battery tests. 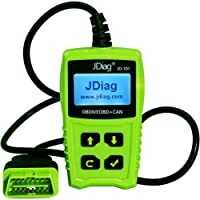 JDiag JD101 is a beautifully designed OBD II scan tool with the ability to read and clear most OBD II error codes. The device is also capable of conducting thorough battery tests. 3 Who Is JDiag JD101 Built For? The JDiag JD101 is compatible with AUTO protocols as well as ISO15765-4 (CAN 11/250). This makes the device compatible with all models of vehicles produced during or after the year 1996. These vehicles include both domestic models as well as imported models. The device works on CAN vehicles as well because it has CAN protocols. The company makes claims that the device is compatible with ALL vehicle models made after 1996. JDiag JD101 is connected to your vehicle via a wire. This wire is connected to the OBD II data link connector in your car. This Data link connector is found under the dashboard or under the handbrake. JDiag JD101 has an LCD backlit display. The display size is 2.4” wide and is a black and white display. The readings are shown in a clear and bold black color which makes the display easy to read. However, despite the display being easy to read, it is substandard in comparison to other OBD II devices. A lot of other devices already use large colored 7” displays. This makes the JDiag JD101 display look insufficient. The b software is designed by the company itself. 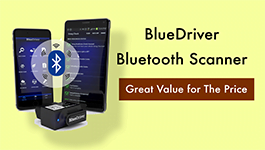 This software is designed to give the user a plethora of diagnostic tools at their disposal. These tools include I/M readiness key and freeze frame data. It is these tools provided that allow for a clear and accurate diagnostics scan. 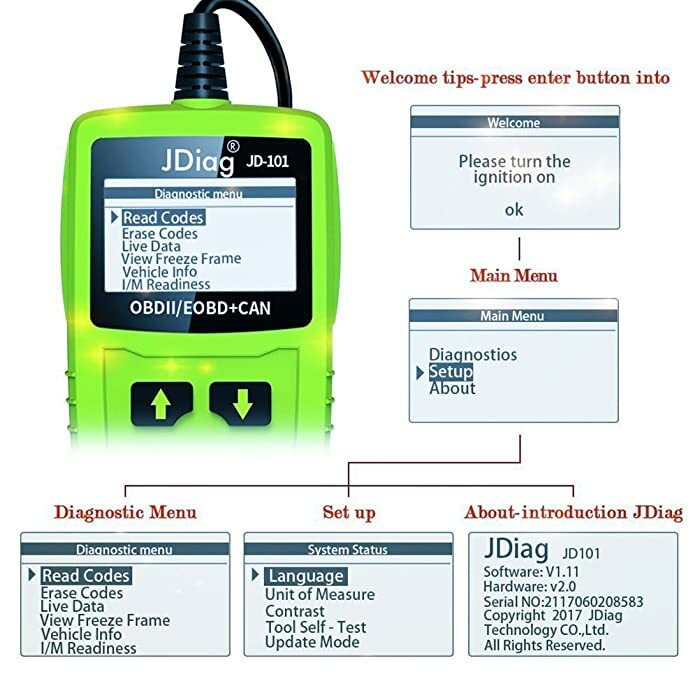 The tools that enable the JDiag JD101 to read both generic and manufacturer-specific error codes. Additionally, you can upgrade the JDiag JD101 software. All you need to do is to connect your device to your computer via USB cable. Then, you download the software upgrade from the JDiag website. From there, all you need to do is upload the downloaded software onto your device. JDiag JD101 best feature is arguably its design. The device is beautifully crafted by the developers. It is designed to portray an elegance of design as well as full functionality. This is why it has tapering lines at the sides in order to increase the grip of the person handling it. Its design is ergonomic in nature to further increase the handgrip of the user. The tiny design also increases the degree of portability of the device. JDiag JD101 weighs a mere 0.22kg. You can easily carry this device in your pocket. You can also place it conveniently in your glove compartment. The JDiag JD101 a live data feature. This feature enables the user to actively monitor their vehicle status. This feature is helpful in two main circumstances. The first is battery monitoring. Live data allows the user to monitor the status of their battery. You can monitor the voltage that your battery is running at as you drive helping you decide whether the battery is healthy or not. Secondly, live data helps during vehicle repairs. You easily monitor the status of your various vehicle components while repairs are proceeding. This enables you to determine to what degree your car is fixed. JDiag JD101 is mainly designed to read the causes of check engine warning light. The device performs an accurate scan of the engine system and gives a report on what issues face the engine. Additionally, the JDiag JD101 provides a brief explanation of the exact cause of the check engine warning light. This helps the user to determine what kind of action is to be taken. 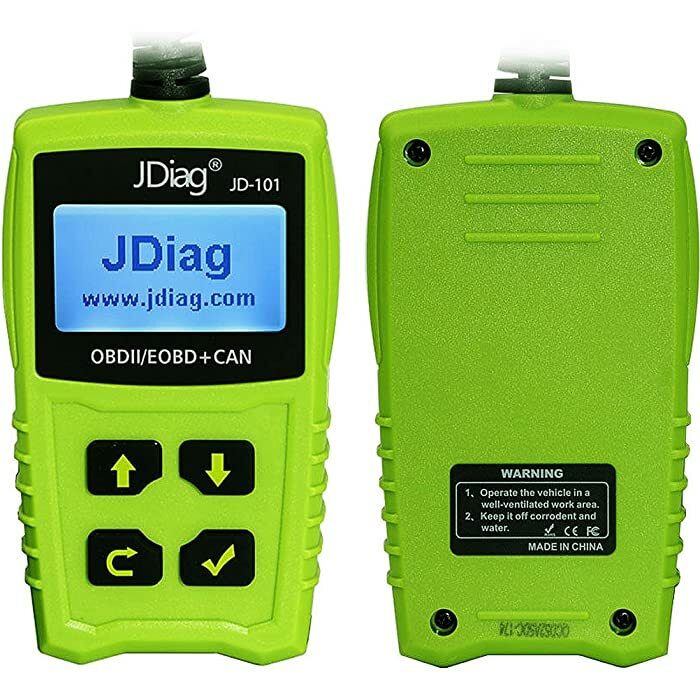 JDiag JD101 has the ability to read both generic codes and manufacturer-specific codes. It can read error codes from a wide variety of vehicle models. 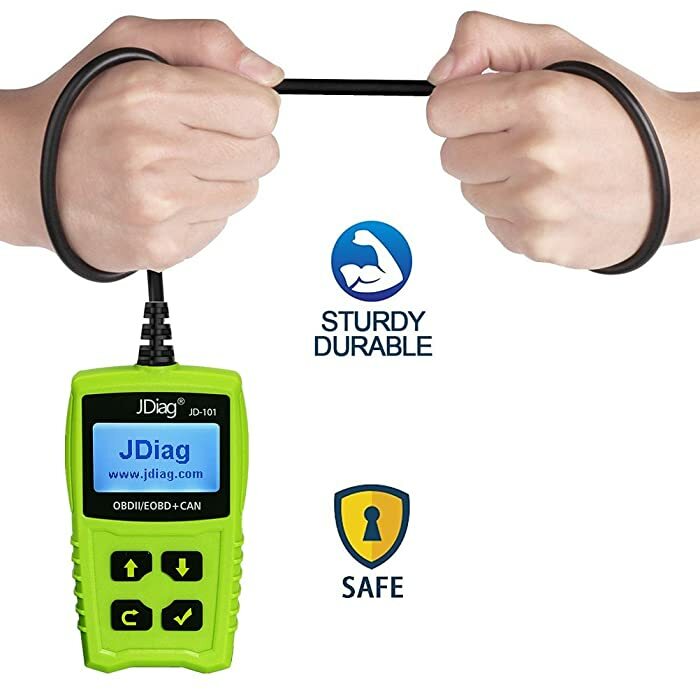 For ease of connection, the JDiag JD101 is able to give you your VIN number and vehicle calibration ID. These details allow you to connect your car rapidly to the device. JDiag JD101 accesses your vehicle’s memory to read all the pending error codes. It then gives you the definitions of these codes. Then, you can fix the issue and clear the error codes. Unlike other devices, you can disconnect the JDiag JD101 while the car is running. 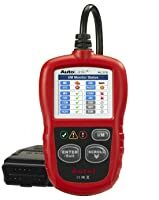 A few customers complain that the device will not work connect with their vehicles. Free Online Update available. It offers CEL turning off, Freeze Frame date, I/M Readiness Test. Features a screen and LED notifications for data relay and analysis; Covers almost all OBD2-compliant vehicles. Compatibility issues with some models. Bottom Line JDiag JD101 is great for beginners and DIYers. 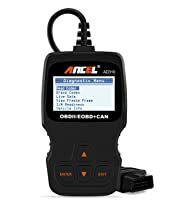 Ancel AD310 is a good code reader for beginners and DIYers. Autel Al319 OBD2 scanner is a perfect pick for ordinary car owners. Who Is JDiag JD101 Built For? The JDiag JD101 is a great tool for the average DIYer as well as the beginner. It contains sufficient tools for both to accurately scan their engine systems. However, a professional mechanic would find these tools inadequate for their work.